HTC Zoe is a mini social network centered around sharing photos and videos. A landmark feature is the cool Highlights videos, which are created automatically for each album. Zoe requires you to sign in with your HTC account the first time you open it. This is to enable sharing with other contacts, who can add their own photos, videos and music to the Highlight videos that are created automatically from your shots. You can send requests to your friends too, to give them a little nudge to add shots to your Highlights. You can manually create a Highlight video too - you simply choose from the available images, select a theme and soundtrack and you're done. The Gallery app uses a Lollipop style navigation drawer to separate viewing modes. Timeline and location group photos accordingly, while Albums work like folders. You can manually create albums, the app will ask you to select a number of photos and videos to either copy or move. Mass selection of photos seems to be lacking which is rather annoying and photos have to be moved one by one. A nice little addition to the gallery is the custom search function. Interestingly enough it not only does through photo meta data, but can also do a sort of reverse image search and find similar photos to a preselected one. Manually created albums get a Highlight video as their title image. You can select which items go into the video, in what order and with what effects and music. There are options to go back to the default chronological order, music and theme so don't be afraid to experiment. The start and end clips can be selected manually if you want to create a sort of title card and credits. The editing options range from basic crop/rotate/flip to frames and advanced effects like simulated lighting, adjusting face contour and eye enhancements. There's a special Media gesture useful here and in the music and video players - swipe up with three fingers to "throw" the content you're viewing to a DLNA device. 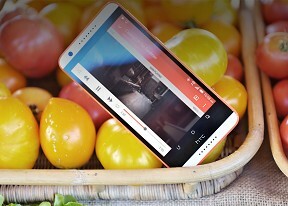 There's no dedicated video player on the HTC Desire 820, you browse videos through the Gallery or File Manager. The video players supports the most common containers - AVI, MP4 and MKV and even WMV - but codec support is spotty. DivX didn't work at all, while XviD support was 50/50, with older versions refusing to play. Sound is an issue too with no multichannel audio support, we even had an issue with MP3 audio in a 1080p AVI file. AC3 seems to be all but unavailable. As for the interface, you get basic playback controls and the option to snap a screenshot. Subtitles are not supported. The HTC Sense 6 music player uses a tabbed layout and as with other apps you can hide tabs and reorder them. The tabs sort your music library by different categories and include the relatively rare Folder view, in case you have a sort of "mixtape" folder. The first time you launch the music player it will ask whether it should automatically download Album art, artist photos and lyrics and you can limit it to Wi-Fi only downloads. There's a cool visualizer on board with multiple different looks, but HTC once again forgot to put in an equalizer. All you get is a BoomSound option, which can be either on or off and only works with headphones plugged in. Still audiophiles should be glad to hear FLAC is supported (both 16-bit and 24-bit) but you'll really need a microSD card for that as the built-in memory isn't much. You can use the three-finger Media gesture to continue playback on a DLNA device. Bluetooth with aptX is another high-quality option to wirelessly stream audio. The HTC Desire 820 also packs an FM radio receiver too, though it doesn't have RDS support. It can play through the speakers but still needs a pair of headphones to serve as an antenna. When we start referring to an audio output as good as the one on the Desire 820 as "slightly disappointing", this tells you all you need to know about the status HTC was able to achieve in terms of audio reproduction. It's not that the phablet does bad, in fact it's quite good, but it's not as perfect as its stablemates we've reviewed lately. The HTC Desire 820 showed high volume levels in the first part of our test - the one where it works with an active external amplifier. Its output was very clean too as testified by the majority of its scores, which were excellent. 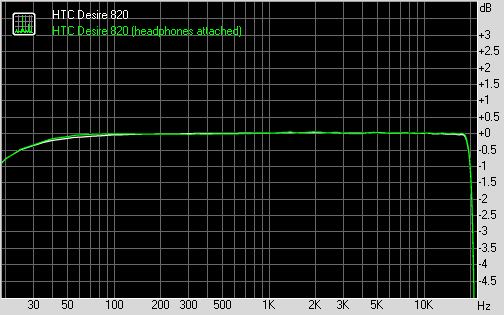 The sole exception was stereo crosstalk, which was slightly above average for this scenario. Plug in a pair of headphones and you get a lot of extra crosstalk as well as some distortion, leading to a less than perfectly clean output. Volume levels are still fairly high and the output is overall above average, but it's not a class-leading performance as we we've come to expect from HTC handsets.